I am an ad posting expert. Advertising is a great way to promote your website, blog, business, product etc. I am doing ad posting work for last 6 years. I am willing to do 40 Posts only for $5. you can have the coolest most professional site online in USA, however, without backlinks and visitors your site is simply another mansion in the middle of the desert. Just waiting to be discovered. 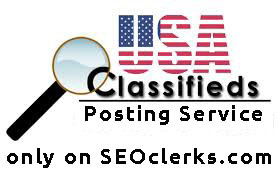 With our USA Classified Submission Services, your site and classified advertisement, will have exposure through out the Internet. Why You Should Include Classified Ad Marketing In Your Promotion Strategy? Thousands of potential buyers search the online classified ads daily for products and services. You absolutely wish to have your ads listed with your Local classified advertisements websites as possible. 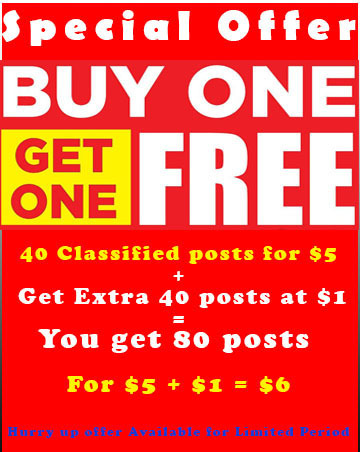 Buy1 Get 1 Free - Post 40 Times Your Product Ad on USA Classified Websites is ranked 5 out of 5. Based on 51 user reviews.